Recently I received my order of the Animal Palz Mini Sandwich Maker and Egg Press. It makes a lamb, bat, panda, and monkey. Of course for my first time using it I had to see how many different things I could make with the lamb. This was my first time using an egg mold. I was happy that it was easy and turned out so cute. The whole kit was easy and fun to use! Egg: Molded hard boiled egg to look like a lamb. 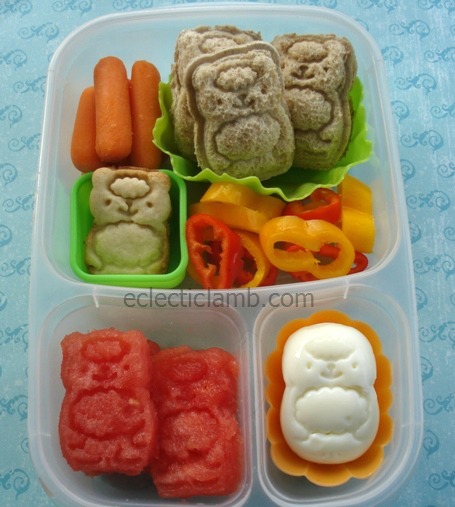 This entry was posted in Bento / Cute Food, Food and tagged animal, bento, CuteZCute, lamb, sheep, vegetarian. Bookmark the permalink. They are so much fun. The directions are the box are clear but there are also wonderful videos showing them in action. Oh me oh my! I want one. I need one. The question is where can I get my hands on one in the UK?? Eats Amazing has an online bento supply shop in the UK http://eatsamazing.co.uk/shop She does not have these cutters yet as they are very new but she expects to carry them in the future. Excel-lamb bento. This nifty thing sounds like a great investment! It is and so much fun to use.